The latest model Catalina 35 Mk II makes for comfortable sailing. Accommodation suitable for up to five, one bathroom, two generous cabins and the saloon will accommodate another single. 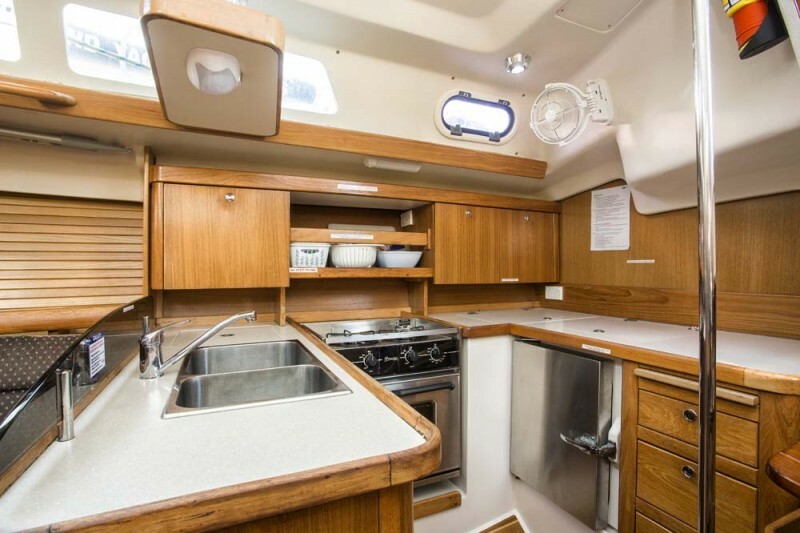 Good refrigeration space, a large shaded cockpit, plenty of hatches. Roller furling headsail, full batten main, full shade for the cockpit, and wind instruments. A luxury boat, easy for one couple to sail. Suitable for your honeymoon, two couples or small families. We came from France to experience paradise on earth. Whitsunday Escape is a very reliable boat rental. In our 25 years sailing it is the first time we did not encounter any problems. We want also to thank the team, they have been excellent and proactive during all the booking and preparation phases. A special message to Jimmy who was great and so kind on briefing and at the return. We will come back!